I realize these are not actual recipes. I like to think of them as serving suggestions. If you need specific measurement instructions to make a s’more than you need more help than I can give you. . .no offense, of course. Last weekend Tim and I headed out to camp again with a group of great friends. Or ‘glamp’ (Google it) as I like to call it because unlike the last time we camped, this time we were at a campground with showers and running water. VERY swanky! Oh yea, and they also had apparent leprosy in the water at the lake so maybe not as swanky as it could have been. Kidding! What they really had was swimmer’s itch. Which from my experience is way worse than leprosy! (Google it-nasty) And yes, we were warned. Did we disregard the warning and get in the water anyway? Yes, as did everyone else on the crowded beach. Did half the group we were camping with end up with an itchy rash? Yup! We made some s’mores while we were there. Go figure. Well actually I would have liked to make even more of them but you sort of hit the wall after a few s’mores and you throw down your toasting stick in defeat. 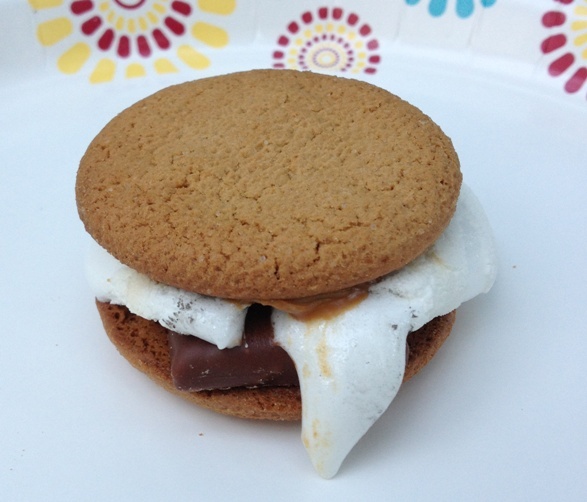 Before we were defeated we made some inspired s’mores so I am going to share them with you. 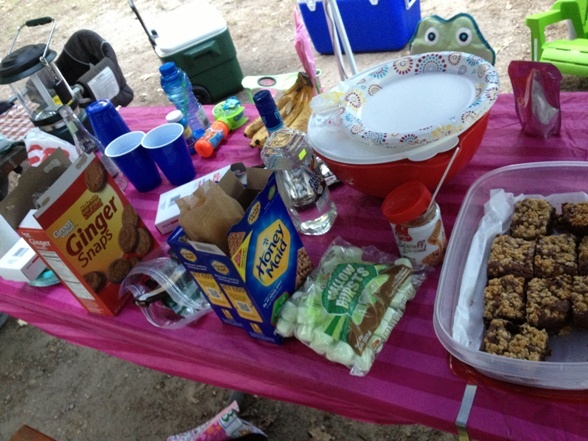 We had an impressive spread of choices for the s’mores. We got creative. Graham crackers of assorted flavors, shortbread cookies, ginger snaps, assorted candy, green apple, cream cheese, lemon curd, Biscoff, raspberry preserves, marshmallows, etc. 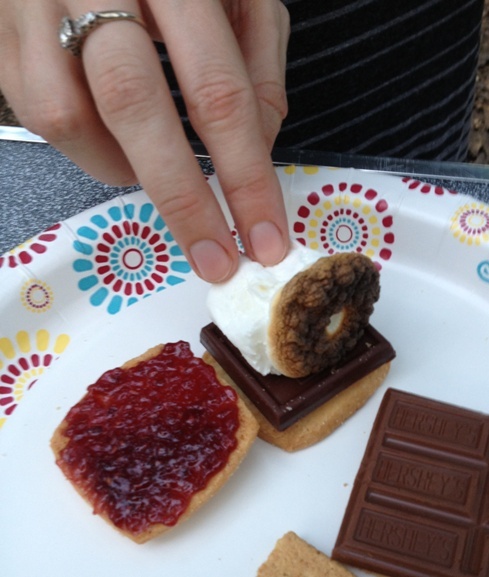 . . First up, my girlfriend, R, put together a classic in s’mores form. Yum! 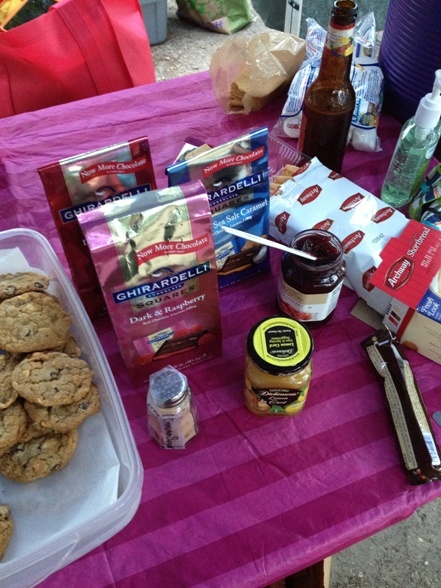 She started with a shortbread cookie, topped with a square of raspberry filled dark chocolate. 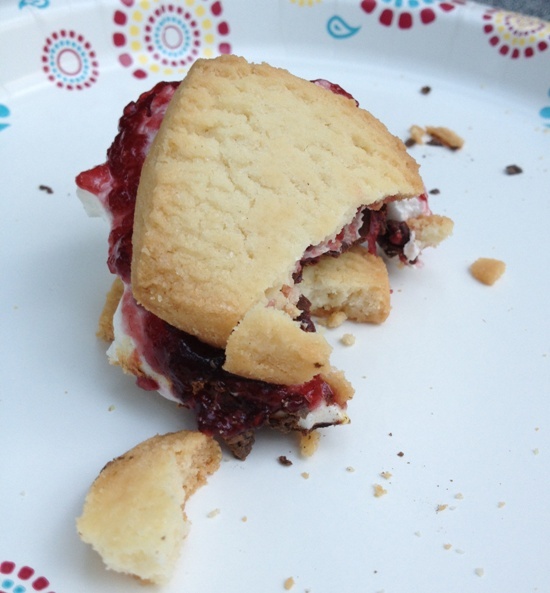 She added a well-toasted marshmallow and topped it off with another shortbread cookies slathered in raspberry preserves. Umm. . delicious! Messy but delicious! I suggest this serving idea to you! (See-serving suggestions.) Next up a little number my girlfriend, S, put together. 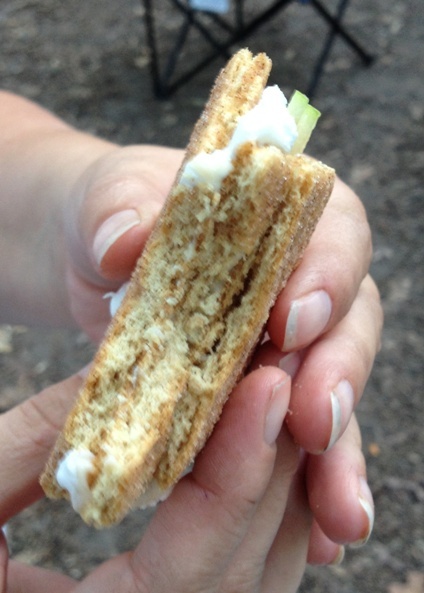 Start with a cinnamon graham cracker, smear some cinnamon cream cheese on it and artfully arrange a few green apple slices on top. 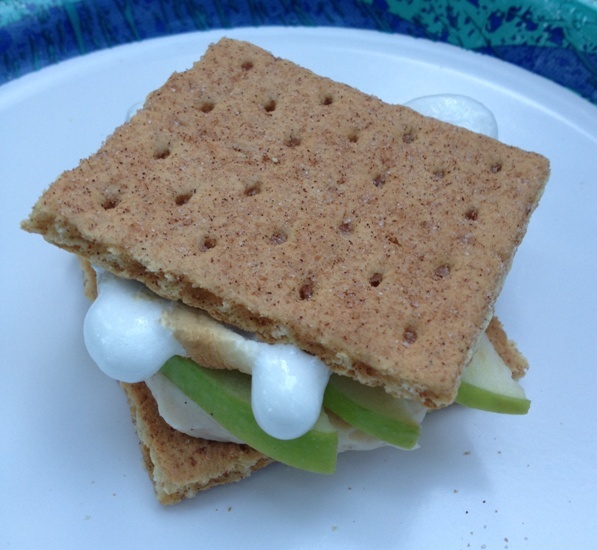 Add your gooey toasted marshmallow and top with another graham cracker. Voila! Sweet and gooey and yet refreshing with the green apple. 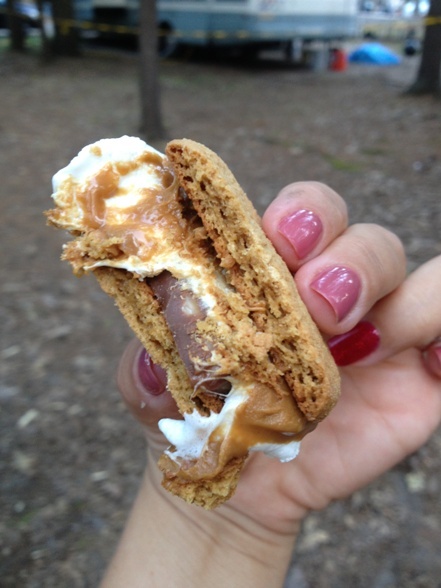 I would say this s’more screams fall bonfire. How perfect! Apples are in season now folks! 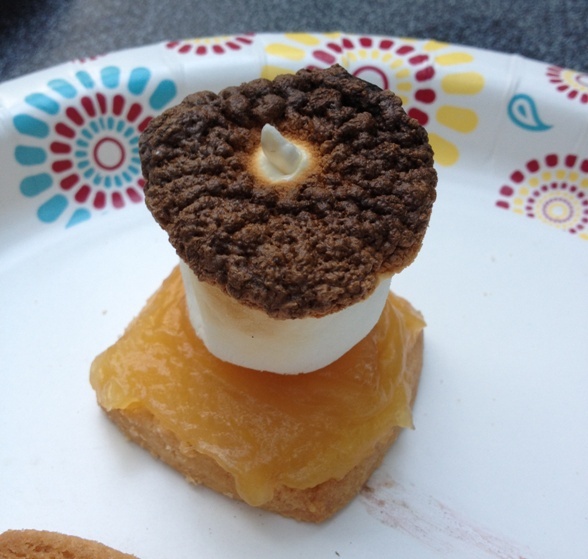 I had some fun concocting a delicious s’more of my own. Gingersnap cookies with Heath bar. Topped with a melty marshmallow and Biscoff spread! To give credit, Tim suggested the Heath bar which is a favorite of his. It all went together beautifully. My only gripe-Heath bars and these particular cookies make an impressively crunchy stack to actually bite through. This one we dubbed the lemon meringue s’more. R made this one and it is brilliant! 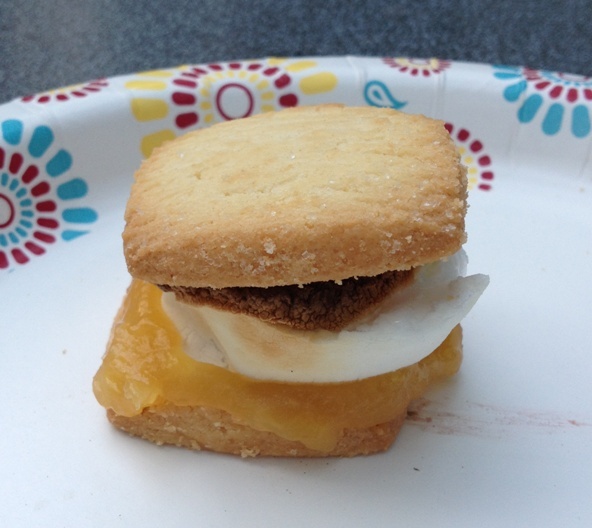 Shortbread cookies with lemon curd and toasted marshmallow. Wow! And isn’t that the cutest little acorn-ish marshmallow you’ve ever seen? Love that lemon curd! 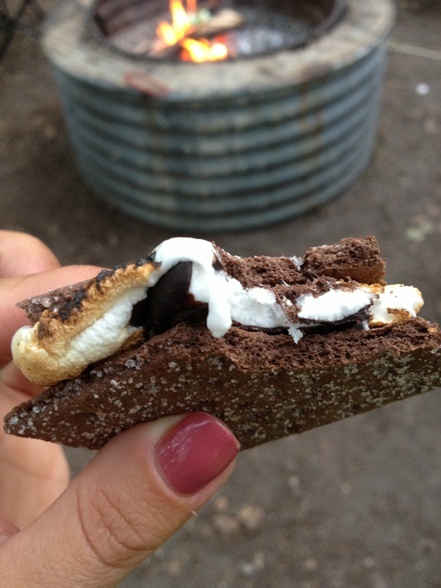 Now to be boring but delicious, Mint chocolate s’mores. 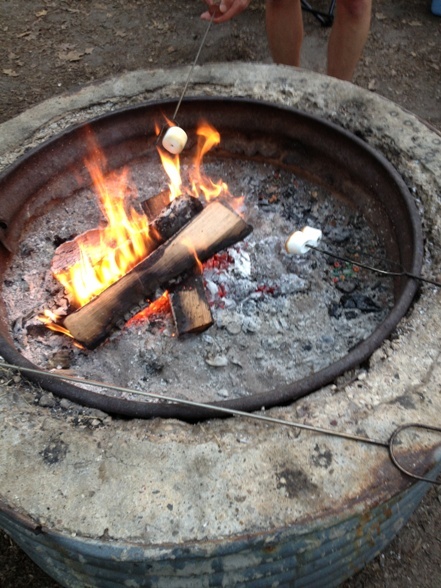 Chocolate graham crackers, peppermint patties (my fave) and the required marshmallow. Simple but so minty and delicious! I love the chocolate and mint combo so this was a natural for me! 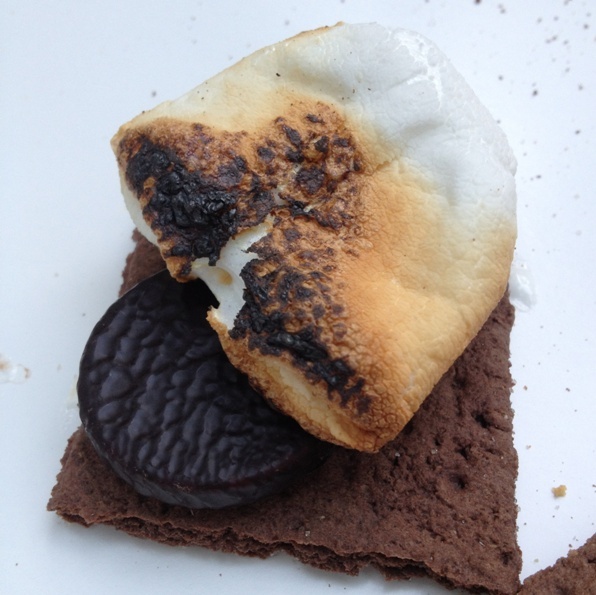 Now I do have to tell you that there was one s’more I really wanted to make but in the end I forgot an ingredient. I really wanted a s’more with dark chocolate and salted pistachios. I was having a hard time figuring out how to incorporate the nuts though. Roll the melty marshmallow in them maybe? It’s on my to-try list. We also talked about using some crispy bacon on them or pretzel crisps in place of the cookie. On the to-try list. Tim and I bought a jar of coconut curd at the grocery store yesterday and this morning I realized I had missed an opportunity for tropical s’mores!!! Here’s what I’m thinking-chocolate graham crackers, thin dark chocolate shavings, toasted marshmallow, thin sliced pineapple and coconut curd. Pina colada s’more! Yes, please. Eaten with an umbrella drink, of course. I can’t believe I didn’t think of that before we camped. We even had coconut rum with us for the umbrella drinks! Or coconut curd with key lime marshmallow. Yes, they sell key lime marshmallows and Tim is a little in love with them. A coconut key lime pie s’more! So many ideas! So little summer left! These sound awesome! Gotta try some soon. Like tonight?